The Geological Survey of Alabama supported research to develop a streamflow reconstruction for the Choctawhatchee River near Newton, AL. The research was two-fold in that first, a new tree-ring chronology was developed for a site adjacent to the Choctawhatchee River near Bruce, FL and, second, utilizing this new tree-ring chronology, seasonal [April-May-June-July-August-September (AMJJAS) and April-May-June (AMJ)] reconstructions of streamflow for the Choctawhatchee River near Newton, AL were successfully developed. The Choctawhatchee River appears to be in a period of low flows (drought). 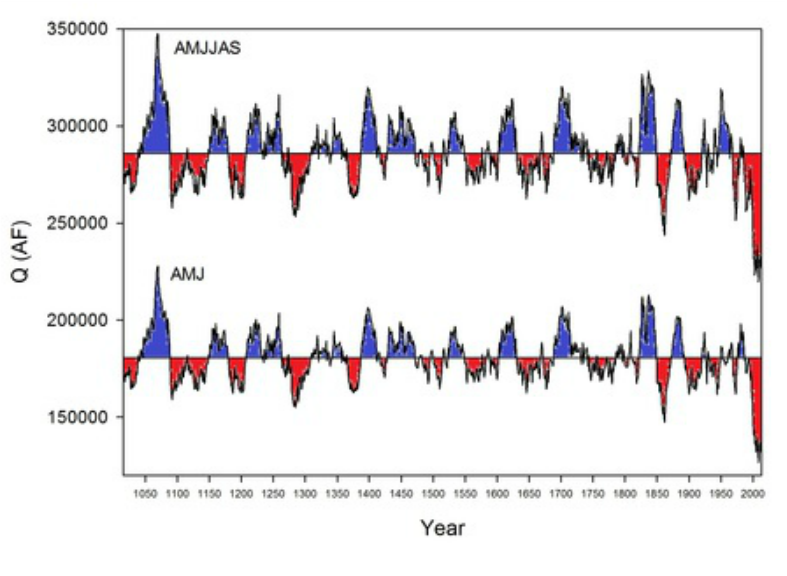 When combining reconstructed (992-1935) with observed (1936-2003) AMJJAS and AMJ streamflows, the driest 25-year period was from 1985 to 2009 and the driest 5-year period was from 1985 to 1989, both periods falling within the observed record. One of the driest 10-year periods appears to be from 1999 to 2008, again falling within the observed record. To confirm these findings, we examined the observed CY streamflow record for 1936 to 2013 (78 year period of record). Six of the eight driest years have occurred since 2000. Similar results were observed with AMJJAS and AMJ seasonal streamflow as five of the eight driest years have occurred since 2000.